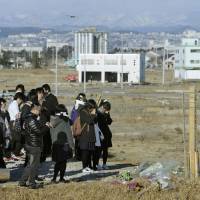 SENDAI - About 90 students from a high school in Fukuoka visited a tsunami-ravaged area in Miyagi Prefecture on Saturday after their school trip was changed so they could learn from the disaster. 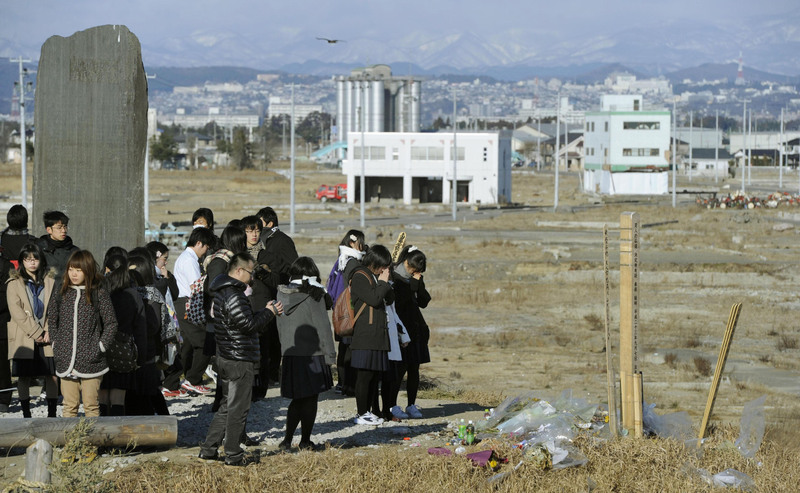 Shuyukan Senior High School changed the destination from Nagano Prefecture, bucking a trend among schools to avoid areas hit by the March 11 earthquake and tsunami, to a large extent due to radiation concerns stemming from the Fukushima nuclear crisis. “I haven’t decided on my aim for the future, but I’ve become interested in jobs to help people in trouble. There are many things you can’t understand unless you actually see them on the spot,” said Yuki Urakoshi, 17. Some 350 second-year students are taking part in the four-day excursion to the Zao ski resort in Miyagi Prefecture. They could chose among three programs, and 90 opted to visit a devastated district in the city of Natori at the mouth of the Yuriage River. One of the other programs is for skiing only. The students appeared stunned as they viewed the devastated area from nearby high ground. “I want them to see disaster areas with their own eyes and grow into manpower that can forge the future of Japan,” the school’s principal, Toshiaki Nakashima, said. The original Nagano excursion, also a ski trip, had been chosen in light of parents’ concerns about aftershocks in devastated coastal areas, according to the school. Shuyukan Senior High School is known for its high rate of students advancing to top universities, including medical schools. The students who visited the Yuriage area were scheduled afterward to receive some training by the nonprofit organization Rocinantes, which is providing medical support in the disaster areas, as well as at Tohoku University’s School of Medicine. The school’s decision to visit Miyagi impressed Fumio Sakamoto, head of operations at the Tohoku Tourism Promotion Organization.